I promised to make periodic returns to ABC’s Agents of SHIELD a few weeks back, and the time has come to see how things have shaped up since we last checked in with Coulsen and the other passengers on the (short) bus. Peek below the fold for some thoughts on recent developments. First, I’m gonna warn you that there are minor spoilers ahead, but I’ll put some white space around them so you can avoid them if thems your druthers… S’okay. Let me start by saying that there have been some marked improvements since the first three episodes. On the whole, the last several episodes have been of increasing quality—everything from the writing to the performances is getting better—but the show is still struggling to find its legs and figure out what it’s trying to do. 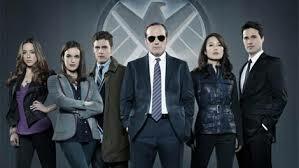 I think that SHIELD’s biggest problem is rooted in its identify crisis: is it a spy show? Is it a corny, dumbed down, Marvel flavored X-Files? Is it supposed to be covering new ground, or just mopping up after the blockbusters? At this point it’s hard to tell, as every episode schizophrenically sets a new tone, while simultaneously carrying forward the least appealing elements of the show—the grating characterizations and awkward relationships. While every week becomes a little less painful to watch, I wonder if that might be because I’m growing callouses and not because things are actually improving. 2) Your metaplot is weak. We watch this show for the Marvel connection, not because we care—at all—about the Scooby Gang (with the exception of Coulsen, though even that is dwindling in association with the rest of the show). So Marvel it up and give us some story arcs that actually show us a world gone mad with super humans. And don’t cop out, goddamnit! Spoiler incoming! And further to my point: The monster (or Chitauri/Extremis related problem) of the week format doesn’t work for this show very well. It just feels like a cornier X-Files season one with lower stakes and no suspense. Soooo…. 3) Raise the stakes: Why are wunderkinds and super agents basically on mop up duty? That is crap for civil servants, not for Coulsen’s flying midlife crisis squad. Give us plots that matter. Leave the crap on the shelf. The last couple episodes were noticeably better, in part that they’ve mostly dropped the no-chemistry romance (fingers crossed they don’t bring it back) and shifted it over into the FitzSimmons arena. And while I can’t say they have chemistry either exactly, there seems to be a lot more dramatic meat to be had there. Arrow has been great. It has been known to dip a little too much into the CW pool on occasion but if you can withstand that, it’s actually a pretty solid comic book show. I’d also say that Arrow’s hot hacker chick is probably one of the best (worst?) examples of “Hollywood ugly” I’ve ever seen.